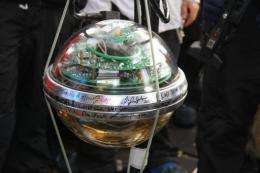 A handout picture taken on December 18 released by the US National Science Foundation (NSF) shows the final Digital Optical Module (DOM) which was to be deployed in the IceCube array, the world's largest neutrino observatory, built under the Antarctic tundra near the US Amundsen-Scott South Pole Station. An extraordinary underground observatory for subatomic particles has been completed in a huge cube of ice one kilometre on each side deep under the South Pole, researchers said. Building the IceCube, the world's largest neutrino observatory, has taken a gruelling decade of work in the Antarctic tundra and will help scientists study space particles in the search for dark matter, invisible material that makes up most of the Universe's mass. 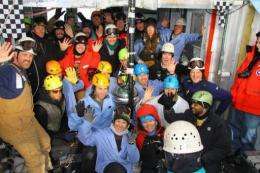 The observatory, located 1,400 metres underground near the US Amundsen-Scott South Pole Station, cost more than 270 million dollars, according to the US National Science Foundation (NSF). The cube is a network of 5,160 optical sensors, each about the size of a basketball, which have been suspended on cables in 86 holes bored into the ice with a specially-designed hot-water drill. NSF said the final sensor was installed in the cube, which is one kilometre (0.62 miles) long in each direction, on December 18. Once in place they will be forever embedded in the permafrost as the drill holes fill with ice. The point of the exercise is to study neutrinos, subatomic particles that travel at close to the speed of light but are so small they can pass through solid matter without colliding with any molecules. Scientists believe neutrinos were first created during the Big Bang and are still generated by nuclear reactions in suns and when a dying star explodes, creating a supernova. A handout picture taken on December 18, released by the US National Science Foundation (NSF) on December 23, shows the final Digital Optical Module (DOM) IceCube project members. An extraordinary underground observatory for subatomic particles has been completed in a huge cube of ice one kilometre on each side deep under the South Pole, researchers said. Trillions of them pass through the entire planet all the time without leaving a trace, but the IceCube seeks to detect the blue light emitted when an occasional neutrino crashes into an atom in the ice. "Antarctic polar ice has turned out to be an ideal medium for detecting neutrinos," the NSF said in a statement announcing the project's completion. "It is exceptionally pure, transparent and free of radioactivity." Scientists have hailed the IceCube as a milestone for international research and say studying neutrinos will help them understand the origins of the Universe. "From its vantage point at the end of the world, IceCube provides an innovative means to investigate the properties of fundamental particles that originate in some of the most spectacular phenomena in the Universe," NSF said. Most of the IceCube's funding came from the NSF, with contributions from Germany, Belgium and Sweden. Researchers from Canada, Japan, New Zealand, Switzerland, Britain and Barbados also worked on the project. It is operated by the University of Wisconsin-Madison. "Antarctic IceCube observatory to hunt dark matter". Poor title, nowhere it is explained what the sought neutrinos have to do with dark matter. Moreover, dark matter was not found in the incomplete Icecube: arXiv:0912.5183: "Search for Dark Matter from the Galactic Halo with IceCube". Dark matter should arise from non-relativistic neutrinos, Europhysics Letters 86, 59001 (2009), but these cannot be observed in IceCube. Nevertheless, I expect a lot of interesting data from IceCube. While I agree that this article fails to explain neutrinos role in studies of DM (neutrinos derive from CDM annihilation), the Ice Cube paper you cite, based on early, incomplete data in no way supports your contention that nearly all DM is composed of hot neutrinos( http://arxiv.org/...83v1.pdf ). From the abstract: "We find that even with the partially instrumented detector and a small dataset, we are able to meaningfully constrain the dark matter self-annihilation cross-section. Future analyses, based on data sets from a larger detector and the inclusion of the Galactic center, are expected to considerably improve these results." While a detailed discussion of your hypothesis wrt hot DM ( http://arxiv.org/...52v2.pdf ) is beyond the scope of a few blog posts here, results from Ice Cube will be of great importance in improving constraints on the DM self-annihilation cross section. No tundra the South pole I think! In physical geography, tundra is a biome where the tree growth is hindered by low temperatures and short growing seasons. Most of Antarctica is too cold and dry to support vegetation, and most of the continent is covered by ice fields. Ditto no "permafrost" - not applied to ice cap which is of course glacial ice not frozen soil.